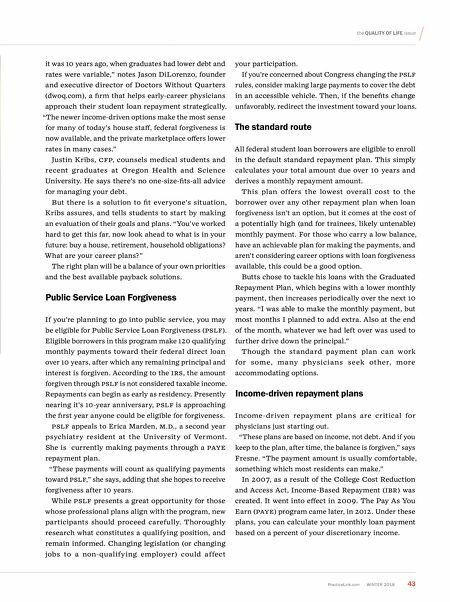 PracticeLink.com W INTER 2018 43 the Q uality of life issue it was 10 years ago, when graduates had lower debt and rates were variable," notes Jason DiLorenzo, founder and executive director of Doctors Without Quarters (dwoq.com), a firm that helps early-career physicians approach their student loan repayment strategically. "The newer income-driven options make the most sense for many of today's house staff, federal forgiveness is now available, and the private marketplace offers lower rates in many cases." 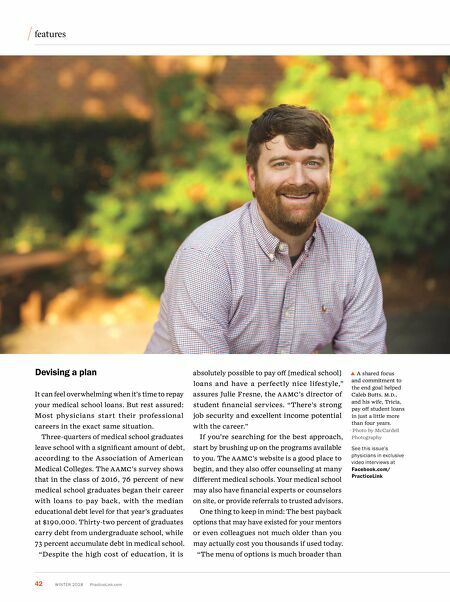 Justin Kribs, CFP, counsels medical students and recent graduates at Oregon Health and Science University. He says there's no one-size-fits-all advice for managing your debt. But there is a solution to fit everyone's situation, Kribs assures, and tells students to start by making an evaluation of their goals and plans. "You've worked hard to get this far, now look ahead to what is in your future: buy a house, retirement, household obligations? What are your career plans?" The right plan will be a balance of your own priorities and the best available payback solutions. Public Service Loan Forgiveness If you're planning to go into public service, you may be eligible for Public Service Loan Forgiveness (PS l F). Eligible borrowers in this program make 120 qualifying monthly payments toward their federal direct loan over 10 years, after which any remaining principal and interest is forgiven. According to the IRS, the amount forgiven through PS l F is not considered taxable income. Repayments can begin as early as residency. Presently nearing it's 10-year anniversary, PS l F is approaching the first year anyone could be eligible for forgiveness. PS l F appeals to Erica Marden, M.D., a second year psychiatry resident at the University of Vermont. She is currently making payments through a PAY e repayment plan. "These payments will count as qualifying payments toward PS l F," she says, adding that she hopes to receive forgiveness after 10 years. While PS l F presents a great opportunity for those whose professional plans align with the program, new participants should proceed carefully. Thoroughly research what constitutes a qualifying position, and remain informed. Changing legislation (or changing jobs to a non-qualifying employer) could affect your participation. If you're concerned about Congress changing the PS l F rules, consider making large payments to cover the debt in an accessible vehicle. Then, if the benefits change unfavorably, redirect the investment toward your loans. The standard route All federal student loan borrowers are eligible to enroll in the default standard repayment plan. This simply calculates your total amount due over 10 years and derives a monthly repayment amount. This plan offers the lowest overall cost to the borrower over any other repayment plan when loan forgiveness isn't an option, but it comes at the cost of a potentially high (and for trainees, likely untenable) monthly payment. For those who carry a low balance, have an achievable plan for making the payments, and aren't considering career options with loan forgiveness available, this could be a good option. Butts chose to tackle his loans with the Graduated Repayment Plan, which begins with a lower monthly payment, then increases periodically over the next 10 years. "I was able to make the monthly payment, but most months I planned to add extra. Also at the end of the month, whatever we had left over was used to further drive down the principal." Though the standard payment plan can work for some, ma ny physicia ns seek other, more accommodating options. Income ‑ driven repayment plans Income-driven repayment plans are critical for physicians just starting out. "These plans are based on income, not debt. And if you keep to the plan, after time, the balance is forgiven," says Fresne. "The payment amount is usually comfortable, something which most residents can make." In 2007, as a result of the College Cost Reduction and Access Act, Income-Based Repayment (IBR) was created. It went into effect in 2009. The Pay As You Earn (PAY e ) program came later, in 2012. Under these plans, you can calculate your monthly loan payment based on a percent of your discretionary income.